When servicing a car or truck air-conditioning system, vehicle owners generally have several options to recharge a/c systems with refrigerant. 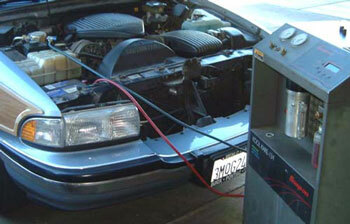 One option is to top-off your car’s system with refrigerant, and another is to evacuate and recharge the system. Both of these options will provide cool air in the passenger compartment for some period of time. Neither service, however, involves permanently fixing the a/c system leaks that allowed refrigerant to escape resulting in a lack of cool air. You might therefore also choose to have any leaking components in your a/c system repaired or replaced when you bring your vehicle in for servicing. By stopping the leak, you will prevent refrigerant from leaking into the atmosphere. The refrigerant in older vehicles is CFC-12 (also known as Freon, a brand name), which is no longer manufactured in the United States because it depletes the ozone layer. As nationwide supplies dwindle, it is becoming increasingly expensive to purchase CFC-12, so that fixing a leak may be more economical in the long run than continuing to purchase CFC-12. This document will provide answers to certain questions you might have about recharging your car with refrigerant during the course of a/c servicing.